Will TKMS Pay Penalty For the Delays In Reis Class Construction Project? 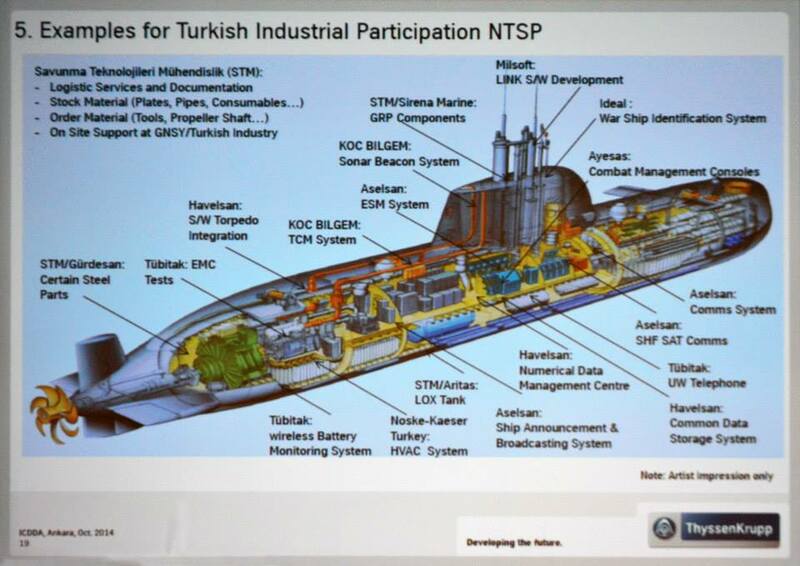 This presentation by TKMS shows the local Turkish content in the upcoming Type214TN submarines. which is substantial compared to the previous submarine construction projects. The German newspaper Handelsblatt run a story about the penalty to be paid by German submarine constructor Thyssen Krupp Marine Systems (TKMS) to Turkey. The reason for this payment is the delay in, construction of 6 Type 214 TN submarines Turkey as agreed to buy From TKMS in 2009. On 2 July 2009, a contract was signed between Turkey and Howaldtswerke-Deutsche Werft GmbH (HDW), Kiel, a company of TKMS, and MarineForce International LLP (MFI), London, for the delivery of six material packages for the construction of Class 214 submarines which are now called as the Reis class. The value of the contract is estimated as 2,5 billion €. There is %80 offset agreement. The submarines will be built in Gölcük Naval Shipyard where 11 submarines of Type 209, were previously built. According to the original contract terms the construction was to start in 2011, and the first sub delivered in 2015. The reasons for the delay of the construction is both technical and commercial. The technical delay is related to the much reported to the stability problems the Type 214 submarines experienced. The stability problem was one of the main reasons why Greek Navy refused to accept its first Type 214 HS Papanikolis years ago in the first place. The solution to the stability problem by TKMS was to add weights to certain places in the submarine in order to create a stability. But Turkish Navy was not satisfied with this come up with its own solution where the center of gravity of the submarine was relocated,by adding extending the length of the submarine. The solution has to be validated by TKMS and this is one of the delay in the project. This also means that Turkish Navy is working seriously in submarine design and problems associated with it. In the end Turkish Type 214 submarines will be a few meters longer than the other nations Type 214 submarines. The Type 214 construction project is the last project where Turkish Navy will construct a submarine to a foreign design and subsystems. It is not a secret that the next submarines constructed by Turkish Navy will be local design with most of the critical components ans sub systems produced with local input. It is not surprising to see the large Turkish industrial participation in the Type 214 project as this project is regarded as preparation phase for the Milli Denizaltı (Milden). Milli Denizaltı means National Submarine in Turkish. So it is understandable for the Germans to drag their feet in the Type 214 project especially when they know that this is the last of its kind. One Response to Will TKMS Pay Penalty For the Delays In Reis Class Construction Project?